The Crofton Roman Villa (Roman House) at Orpington, Kent. Tuesdays and Wednesdays: 10am to 1pm & 2pm to 3.30pm (last entry 3pm). Bank Holiday Mondays: 10am to 1pm & 2pm to 3.30pm (last entry 3pm). First Sunday in each month: 2pm to 4.30pm (last entry 4pm). Volunteers wanted in 2019! NEW. Wednesday 10th April & Wednesday 17th April. Discover what the Romans used for cooking, eating and drinking. 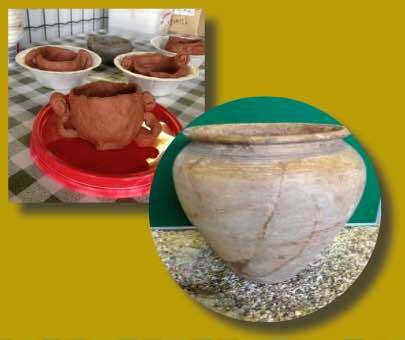 You will be able to handle real Roman pottery nearly 2,000 years old. Then you can make your own clay pot to take home! For up to 11 year olds. Entry £4 per child, adult carer free. Parking available off York Rise, adjacent Orpington Railway Station. The Crofton Roman Villa house was occupied from about AD 140 to 400 and was the centre of a farming estate of about 500 acres. Nearby would have been farm buildings, surrounded by fields, meadows and woods. The house was altered several times during its 260 years of occupation and at its largest probably had at least 20 rooms. The remains of ten rooms can be seen today, now within a modern cover building. Two rooms contain the remains of their opus signinum (concrete) floors, and three have evidence of tessellated (tiled) floors. Details of the under-floor central heating (hypocaust) can be seen, which features both channelled and pillared systems. What's provided at the Villa. SPECIAL activity workshops for Schools. Two hour sessions. (Wednesday, Thursday, Friday) £3 per child. SPECIAL Facility for Societies. Sunday afternoons 1st of each month. Special guided tour of Roman villa for pre-booked societies and groups (minimum 20) by the excavation director, Brian Philp. Normal charges apply, plus a donation to KARU. The site was fully excavated by the Kent Archaeological Rescue Unit which also carried out the complete preservation scheme, with funding provided by Bromley Council. The Unit now manages the scheme in conjunction with the Council. Bus routes: 61, 208 353,R2 and R7. 2nd April to 30th October 2019. Sundays: (1st in the month only) (includes guided tour by an archaeologist.) Last entry 4pm. 2 to 4.30pm. Staffed by the Kent Archaeological Rescue Unit (KARU). Special villa activities in 2019. The 2019 Crofton Villa brochure.